Before anyone says it, yes I have a problem. No, I can't stop buying Lush products. The fact that I have well over 100 bath bombs and bubble bars waiting to be used doesn't stop me stocking up on more, and although I have really tried to resist the Valentine's range (these came out in mid-January and I've waited till now to get my hands on them), I ended up giving in and buying everything that interested me. Whoops. I kept trying to make a Valentine's Day order, but this guy was sold out. Probably based on the cute design and the relatively small price point, because smell-wise, I can't see this being a favourite. It's very strong; I could smell it before I'd actually opened my parcel. Lime and bergamot oils might be present, but for me the dominating scent was the violet leaf. On first sniff this is very herbal, musky and earthy. My husband said it smells like those Parma Violets sweets, but the inclusion of fresh raspberry juice does add an undertone of sweetness. It's fairly close in scent to the Razzle Dazzle bath melt - and honestly, I've never been much of a fan. I'm hoping that once this is in the water it'll release it's full potential. A Valentine's Day classic, although what unicorns have to do with the day of love I have no idea. This product was originally released in 2015, and had something of a glo-up last year when it's bright primary colours were replaced with more elegant pastels, and the little stars jammed into the sides were swapped for a pretty silver lustre. It also just became a better product - offering more bubbles, a better colour in the water, and a gorgeous, relaxing scent. This is honestly one of my favourite bubble bar scents: full of lavender, ylang ylang and neroli that actually makes me feel a bit sleepy every time I take a sniff. The perfect way to wind down before bed! I love this bath bomb. Nah but really, it's so unassuming in terms of appearance, but don't be fooled! This little guy smells incredible; full of cocoa butter and vanilla absolute, it reminds me in scent of the Stardust bath bomb from Christmas but with a kick thanks to Brazilian orange oil. It's almost reminiscent of a powdery chocolate orange - delicious. The red cocoa butter hearts float on the surface of the bath, dissolving away to add extra moisture to the skin. This is a good all-rounder, and definitely a classic Lush product that smells beaut and will leave your skin silky-smooth. Fun fact: this bath bomb is where my obsession with the Rose Jam scent family began. It sat in a box in a corner of my room, but every time I opened the door it was all I could smell and it was heavenly. This year this bomb has been released as a Valentine's product instead of a Mother's Day gift, and personally I think it fits much better. For the unfortunate souls who have never had the chance to try anything Rose Jam/Ro's Argan scented, this is a great place to start. I honestly hated overly floral scents, but this is a game changer. Rose is a tricky mistress, and can sometimes smell old-fashioned; not so with Rose Bombshell's sweet but natural scent. There's also a little surprise in the middle... if I was running my loved one a romantic bath for Valentine's Day, this is without a doubt the product I'd use. Another example of the adorable character products Lush make so hard to resist! Ladybird is destined to live in my collection for longer than I'd like, purely because of the guilt I feel in breaking it up. This was also a Mother's Day product last year, but I'm not so sure that this fits the Valentine's theme. This little cutie doesn't really match its scent in my opinion; it really smells like toothpaste to me. That'll be down to the peppermint oil in it, but the geranium oil adds a very subtle floral tang. It's very fresh and clean, but I'm not sure it's my favourite. However, that cute little face is irresistible! Immediately, the design of this caught my eye, but not necessarily for the right reasons. Lush is capable of producing beautiful products like Golden Wonder or Intergalactic, and the character products like Monsters' Ball and The Christmas Penguin are charming and adorable. Despite using them in every text, tweet and WhatsApp, I detest emoji merchandise. I can't really work out why Lush chose an emoji-style design, but it comes across as a little lazy to me, although I'm sure as a Valentine's Day gift it would be quite cute. However the smell of this is really odd - very much a hit or miss! Lovestruck contains lemon, geranium and petitgrain oils - I have no idea what the latter smells like which is why I'm fairly sure it's what gives this product the aroma it has. It's so unusual; it faintly reminds me of sherbet lemons but with a spicy undertone. It's definitely not my favourite scent, and I feel like it'd take a brave person to pick this up for their partner if they haven't got a prior seal of approval. By far the most aesthetically pleasing product of the Valentine's collection (in my opinion! ), this little beauty consists of two interlocking bath melts. There are so many different oils and absolutes in this, like almond, argan, apricot kernel, bergamot, geranium, jasmine, rose and ylang ylang - basically, all the best bits of Lush mixed into one. I was therefore quite surprised by how subtle the fragrance is; it's definitely floral but not too sweet, and nowhere near as overpowering as I expected. Obviously you can separate these two and use them individually, but I love to indulge when it comes to melts. Also I've already seen a few pictures, and using the two together seems to produce the most impressive results in the bath. As usual, I avoided the soaps and massage bar as I never actually use them, and the beauty products because, well frankly they're a rip off. I would definitely recommend the Prince Charming Shower Cream but I already had a bottle from last year, so didn't repurchase. Have you picked up anything from the range, or are you going to make a last minute dash to your nearest Lush? I love this haul babe! Some amazing products, I definitely love the sound of them all! I adore the Unicorn Horn, maybe because of its name, shape and that it smells like lavender! Loved this post! 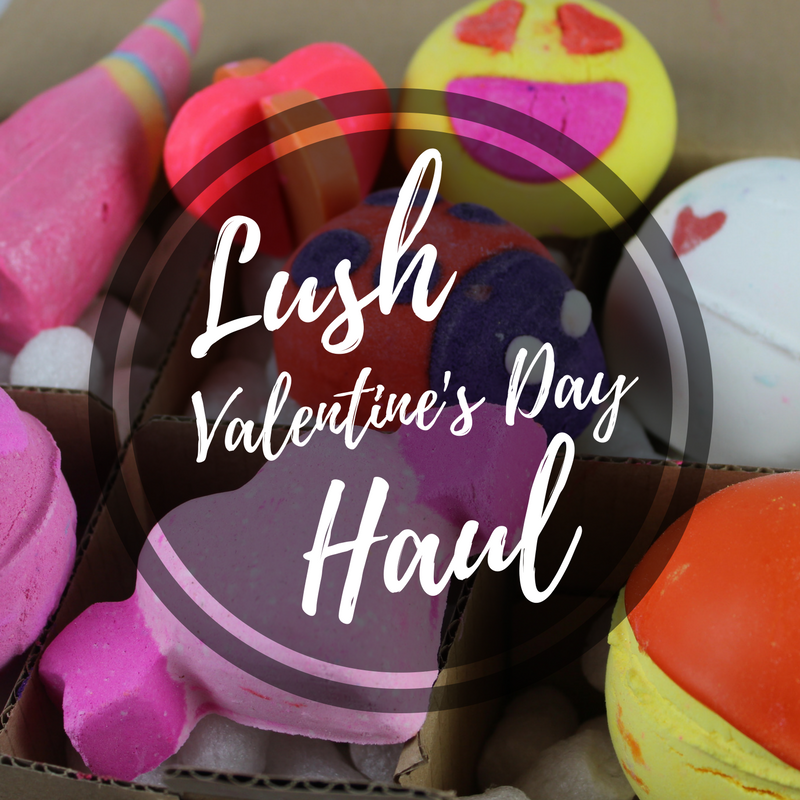 I have a lush haul video going on my YouTube channel in a few hours! I had a couple of things from your bundle of goodies! I wish I had got the ladybug though - how cute!!?? These are all so cute! This post makes me want to go to lush and spend all my money! you're further fueling my lush addiction at every available moment, and as I couldn't get any valentines products this year I'll just have to pray when you use them that they will be on your snapchat.